The kids and I were recently asked to review three albums from Happy Kids Songs, collections of songs for younger children focusing on good values, social, and emotional skills. While these songs are geared towards kids ages 3-8 I am a super caring Mama and "allowed" all the kids to listen to them on the way to Wisconsin (it only took us 6 days to get there and back ... we had a little time). 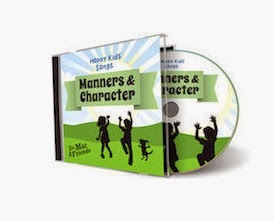 We received three albums, Friends and Sharing, Happiness and Attitude, and Manners and Character, as well as the Happy Kids Songs Workbook, Hands on Activities to Build Character, Social and Emotional Skills. Each CD contains five songs. The 123 page large softcover workbook is filled to overflowing with lyrics, coloring and activity pages and "do together" activities for parents and their kids. While the activities in the workbook are geared toward the children, the workbook itself contains material for both the kids and adults; the coloring and lyric pages for the kids and activity pages for the parent to read. We were able to download the songs onto a blank CD, perfect for taking with us in the car. 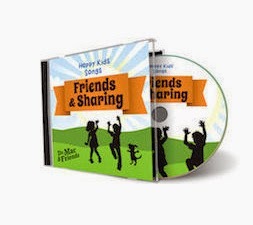 Friends and Sharing includes five cheery songs about playing together and being a good friend. Happiness and Attitude focuses on having a positive attitude and being a good person. Manners and Character reminds the listener of the value of being honest, accepting people who are different (because we all are), and being considerate of others. The songs are written and produced by Dr. Mac (Don R. MacMannis, Ph.D.), a child psychologist, teacher, author, clinician, school consultant, and award winning songwriter. He also wrote and directed the music for the PBS show Jay Jay the Jet Plane. Additional albums available include Social Skills and Bullying, Feelings and Fears, Practice and Success, Talking and Listening, and Respect and Responsibility. The messages of the music is positive - be good to yourself and others, and are intended to help kids be happier by being better adjusted. Sure beats a lot of the current, trendy music kids are exposed to these days. The songs are very upbeat, with catchy tunes. The kids particularly paid attention to a song teaching about giving "kudos" to others. The songs are sung by children, which is a good/bad thing. Many of the songs are really neat - interesting lyrics, fun modern beats, and the kids voices give a more authentic feel, but some of the singing was of a quality that didn't really appeal to me. The kids did not mention anything about the singing, though, so it could just be me. River (age 5) loved the songs. He said it was the "best music ever". He really enjoyed the tunes about friendship and kindness, and wanted to make sure I mentioned that here. The other kids ... not so much. But really, they're 11-16 years old and this music wasn't geared towards them at all, so that's very reasonable. That said, I'm sure that even though they didn't mention it, show it, or thank me loudly they were all really happy to listen to the songs in the car on our 24 hours of drive time (each way, and yes, that 24 hours took three long days). Wouldn't you think? Personally, I think these songs and albums are a terrific reference to fall back on if a problem arose. If River were having a hard time sharing with his siblings or friends, which does happen from time to time, the Friends and Sharing CD would serve as a welcome fun and age-appropriate reminder to share and be a better friend. Also, it's just plain good and clean music for youngsters. Friends and Sharing, Happiness and Attitude, and Manners and Character can be purchased at Happy Kids Songs for $4.95 each and each includes a bonus download of lyrics, coloring, and activity pages. Individual songs are also available for $.99 each. 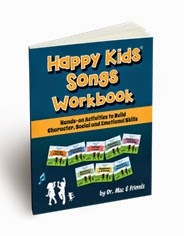 The Happy Kids Song Workbook is also available for $12.56. I hope you'll take a moment to read the reviews from other TOS families by clicking on the image below.